One of the most popular PRC house manufacturers and also, sadly, one of the most unreliable, Airey PRC houses were made from just after the Second World War through to the mid 1950's. It was an Airey house that first prompted the investigation into the safety of PRC homes after one caught fire in the 1980's and the subsequent investigation showed that the steel supports had started to corrode. 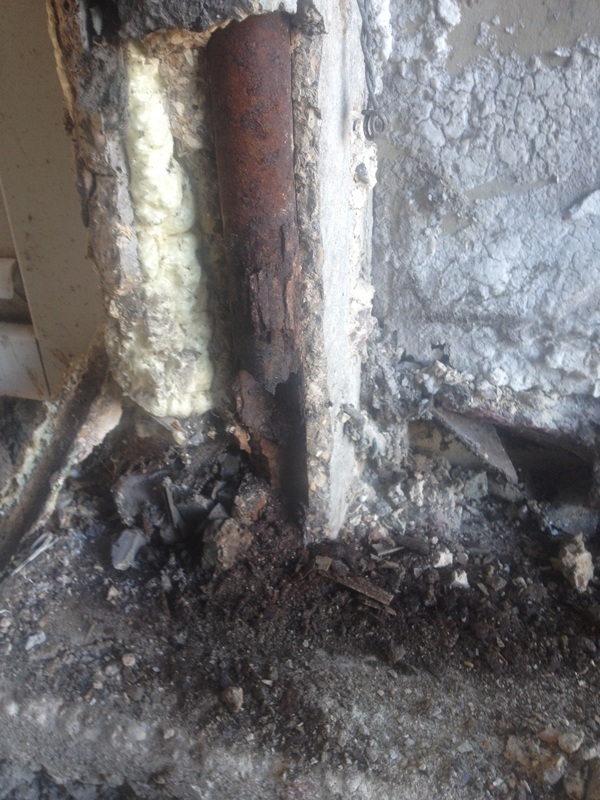 Even those Airey PRC homes that have been repaired in the mid-1980's are still susceptible and many have corrosion in the structural steel supports. We're very familiar with the Airey PRC repair and can improve the structural stability, the insulation and the saleability of your Airey PRC home. This is what happens to the posts on Airey Type PRC houses over the years - the reason why high street lenders class PRC houses as defective. 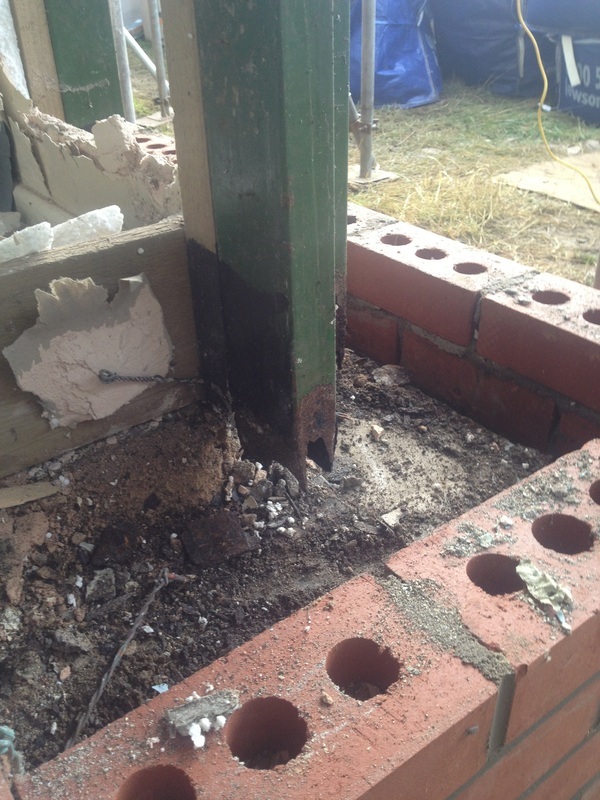 This Airey Type PRC house had a repair of the original concrete posts to these box steel posts back in the mid-80's. This is the corner of the property. But as you can see over time this didn't work and are still classed as defective. Did you know that you may be eligible for a Right to Buy mortgage on your Airey home? This could enable you to obtain a mortgage your home with no savings or deposit and you may even be entitled for a discount up to £77,000! For more information take a look at our Right to Buy mortgages for PRC housing page to see how it all works. We recently had our Airey Construction House repaired by Steve and the gang. They did a wonderful job, on time at the agreed price. We cannot praise them enough they were extremely thorough and picked up several things our architect had missed, and corrected them before they occurred. The site was kept tidy all the way through the work, which meant our neighbours were also pleased with the minimal disruption. We are in a National Park and the building control officers have also been impressed with the quality of workmanship of the PRC Repair. The house looks wonderful as you can see by the pictures and we are already reaping the benefits on the heating bills thanks to the cavity insulation and double glazing. I would be more than happy for anyone considering a repair but not sure who to get to do it to contact me! I just wanted to say a big thank you to you and your team for the renovation work you did for me. The house certainly looks very different from the shabby, concrete clad house we had before. It looks like a brand new house and it’s the talk of the neighbourhood. I couldn’t have hoped for a better run operation. Amazingly, everything went according to how you said it would and your team are a credit to you. It was a great relief for me to have you dealing directly with the building control officer. You can confidently put my name forward as a referee for this type of project, or indeed any other as I’ve found you to be an honest, straightforward builder who takes a pride in his work and reputation. It was noted that when there was a small issue whilst you were on holiday, you took the trouble to call me from Cyprus immediately, and on your return you drove four hours each way to do an hour’s job just to be sure that things were right and I was happy. I wish you continued success for the future. We would like to thank Steve and colleagues for a great job they have done on our home, we have had some great comments on our home from several people and we would like to thank you for looking after us when the weather reached -10C in February. I would like to thank Steve and his fellow work colleagues on the fantastic job they did on our house. I would highly recommend S C Construction to anyone, they can sort your mortgage, contact your council, organise everything whilst you sit back and watch the transformation take place - cheers to everyone involved. Choosing a company to carry out this type of repair to your house can be daunting. I can honestly say I am 100% happy that we chose SC Construction. with the finished product the house looks brand new. recommend them enough to anyone looking to have this work done.